With LIFEPAC 2nd Grade Science, student's dive into worktexts filled with vibrant illustrations and exciting lessons. Incorporating biblical truths, this course's topics include: The Living and Nonliving, Pet and Plant Care, Your Five Senses, Physical Properties, and Changes in Our World. Self-paced and entertaining, this course explains how people are alike and different, how to care for our world, and includes more about plants, animals, and the senses. Additional academic skills include learning vocabulary words and matching words with pictures. 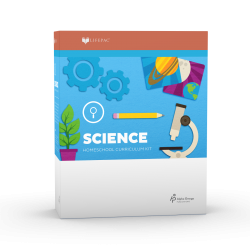 The LIFEPAC 2nd Grade Set contains ten separate worktexts and a teacher's guide.